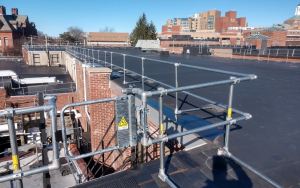 KeeGuard® Contractor system is a free standing solution to roof edge fall protection that requires no hardware connections to the rooftop or working surface. 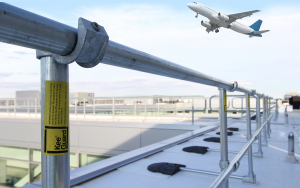 KeeGuard® Contractor can be configured to meet all OSHA Standards for permanent railings, including OSHA Standard 29 CFR 1926.502, 1910.23 & NOMMA Metal Rail manual deflection requirements. 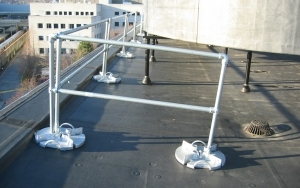 Why use KeeGuard® Contractor guardrail system? Recycled PVC bases, long life, no-rust. Easy assembly using a torque wrench or hex key to tighten set screws to 29 lbs/ft. galvanized finish ensuring a long and rust-free life of the system. 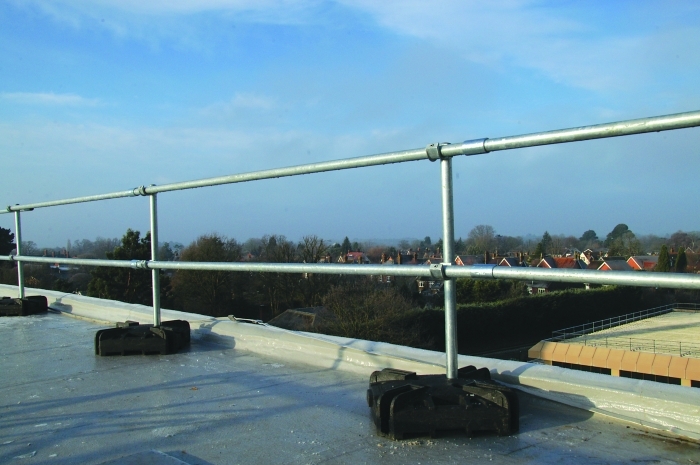 Powder coating in Safety Yellow over a galvanized finish is available as an optional extra. Each base weight is molded from recycled PVC in two interlocking halves, supplied assembled. Overall dimensions are 22" square x 6 1/2" deep and weigh a minimum of 90 pounds. The base weights incorporate comfortable carrying handles for ease of portability. The weight also incorporates slots for an optional standard timber toeboard if required.